Those of us in the aviation business mostly think about aviation in a practical sense. Despite how it might appear on this website, I am not thinking philosophy all the time. Most of my day-to-day thinking is related to just getting through - important things like when to wake-up, get in an exercise session, whether I put gas in the car… you know the drill. As normal as that all is, I am attuned to things that might inspire me to think. That’s how I get my articles. But, sometimes something comes a long that requires no thinking. It is just deeply thought-provoking, without any effort. This picture is all about that. 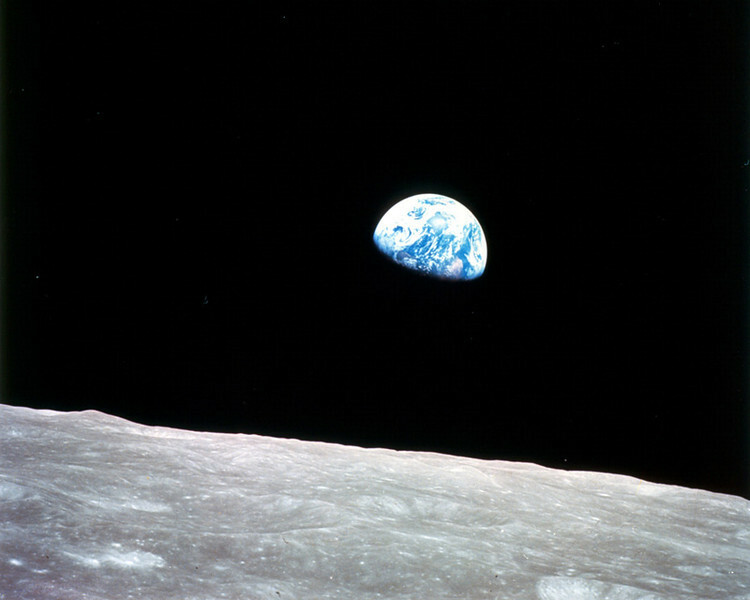 Forty five years ago on Christmas Eve, Apollo 8 circled the moon. While the mission wasn’t nearly as famous as the Neil Armstrong, “One small step for man…,” mission less than a year later, it was notable for many reasons, not the least of which was orbiting the closest celestial body to Earth. Orbiting the moon was a clearly defined technical achievement that everyone involved with the program expected. After all, the stated objective of the manned space program was to put a man on the moon before the end of the sixties. You clearly have to orbit the moon if you’re going to land there. Apollo 8’s mission was a technical increment in the long strategy that would eventually lead to the Apollo 11 landing and Neil Armstrong taking that step. What probably wasn’t so wildly anticipated from the Apollo 8 mission was a world change in perspective in a single moment: the rise of Earth while the Apollo 8 orbiter made its fourth orbit. The crew was doing what they were supposed to be doing when Earth rose from the far side of the moon. Jim Lovell was shooting black and white. William Anders was shooting color, using a highly modified Hasselblad camera. They both captured the scene, which is well documented in audio. 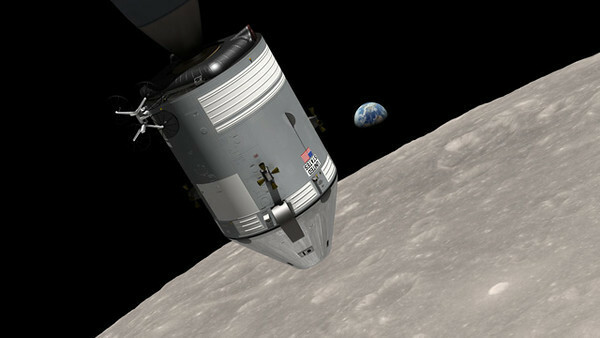 NASA even recreated the events with animated external views. The crew was clearly excited about their capture. They recognized the beauty of the scene. Maybe they even recognized its significance, seeing our world from another planet. For a couple of technical high achievers—i.e., left brain thinkers—the astronauts sure used the right side of their brains to make that capture. The unanticipated effect of this photo comes from the tangible evidence of Earth being alone in a sea of black and seen from another planetoid in the foreground. You get a real sense of looking backwards at Earth from “somewhere else,” as if you were on another planet. Without the moon, it would look more abstract, almost like Earth was painted on a black canvas. With the moon in the foreground of the photo, you get the feeling you have gone somewhere and are now looking back at Earth from the moon. With the moon in the foreground, you have “place” connected to the viewer, making the whole experience less theoretical and contrived. Why is this important? For some philosophers, seeing Earth externally makes a solid connection to the idea our world is but a small vessel in a very big sea of black space. Some say this image was the beginning of the environmental movement. Nature photographer Galen Rowell called it, “the most influential environmental photograph ever taken.” In the context of geo-politics, if you take a step back from the normal everyday activities and embrace the feelings that come from seeing a picture like this, it causes a change in perspective as far as how one relates to the other actors. This is all important in that the normal everyday experience of the billions of humans on our planet is that their whole universe is the surface of the planet, with its blue skies, hard earth, and deep oceans. There is nothing else and it seems so vast. Even though there are text books describing our planet orbiting the sun, as a member of a medium sized galaxy, in a medium sized cluster of other galaxies, it is difficult to embrace what a small thing our planet is. However, when you see our world as presented in this Apollo 8 image, it transforms theory into a bit of reality that our home is but a small place in a very big universe.